The comet that may put on a spectacular light show during a November date with the Sun, was observed by the Deep Impact mission. The spacecraft has also had close fly-bys of comet's Tempel 1 and Hartley 2 and scientific observations of Garradd. A NASA spacecraft has captured its first photos of comet ISON, an icy wanderer that some scientists say could dazzle as a "comet of the century" when it swings through the inner solar system later this year. The photos were taken by NASA's Deep Impact probe and reveal comet ISON as a bright, dusty ball moving against a star-filled background. The spacecraft snapped the pictures on Jan. 17 and Jan. 18 from a distance of about 493 million miles (793 million kilometers). Comet ISON has been the focus of much anticipation among scientists and stargazers because of its potential to put on a spectacular display in late November, when it makes its closest approach to the sun. Some forecasts predict the comet could shine brighter than the full moon. As of mid-January, the comet's tail was more than 40,000 miles (64,400 km). Will comet ISON sizzle or fizzle? "This is the fourth comet on which we have performed science observations and the farthest point from Earth from which we've tried to transmit data on a comet," Deep Impact project manager Tim Larson, of the agency's Jet Propulsion Laboratory in Pasadena, Calif., said in a statement Tuesday (Feb. 5) "The distance limits our bandwidth, so it's a little like communicating through a modem after being used to DSL. But we're going to coordinate our science collection and playback so we maximize our return on this potentially spectacular comet." This is the orbital trajectory of comet C/2012 S1 (ISON). The comet is currently located just inside the orbit of Jupiter. In November 2013, ISON will pass less than 1.1 million miles (1.8 million kilometers) from the sun's surface. The fierce heating it experiences during this close approach to the sun could turn the comet into a bright naked-eye object. Image released Feb. 5, 2013. 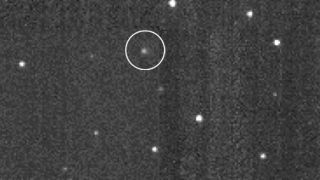 The Deep Impact spacecraft has flown close by two comets, Tempel 1 and Hartley 2, and taken detailed observations of another — comet Garradd —before turning its camera eyes on Comet ISON. The spacecraft used its Medium-Resolution Imager to snap pictures of ISON during a 36-hour period between Jan. 17 and 18, NASA officials said. Comet ISON was discovered in September 2012 by Russian astronomers Vitali Nevski and Artyom Novichonok using a 15.7-inch (0.4-meter) telescope of the International Scientific Optical Network (ISON), near Kislovodsk. The comet is most likely making its first trip through the inner solar system from the Oort cloud, a vast shell of icy objects at the outer edge of the solar system that extends one-third of the way to the nearest star, NASA scientists said. "Having not come this way before means the comet's pristine surface has a higher probability of being laden with volatile material just spoiling for some of the sun's energy to heat it up and help it escape," NASA officials wrote in a statement. "With the exodus of these clean ices could come a boatload of dust, held in check since the beginnings of our solar system. This released gas and dust is what is seen on Earth as comprising a comet's atmosphere (coma) and tail. Comet ISON will make its closest approach to the sun on Nov. 28, when it will approach within 800,000 miles (1.2 million km) of the star's surface. If the comet survives the approach, and does not fade or break apart, it could transform into a spectacular celestial sight, scientists have said. The comet will make its closest approach to Earth on Dec. 26, when it will fly within 40 million miles (64 million km) of the planet. It poses no impact threat to the Earth, NASA scientists said. NASA's Deep Impact spacecraft is currently flying on an extended mission across the solar system. The probe launched in 2005 on a mission to rendezvous with the Tempel 1 comet in July 2005. The encounter was successful, with Deep Impact dropping an impactor onto the comet to create an artificial crater that revealed the inner makeup of the object. In November 2010, the Deep Impact spacecraft flew by comet Hartley 2 as part of its extended mission. The spacecraft observed comet Garradd from afar in January 2012. Since its launch, Deep Impact has traveled about 4.39 billion miles (7.06 billion km), NASA officials said.